I’ve developed Y-BOX for my own purpose. Compared to PLA, ABS is more temperature resistant, elastic and not so brittle. I was not successful in printing ABS before. Objects were deformed by warping. With this box, I get stable environment and temperature around 36-38°C (by 20°C ambient) and can print with the same quality as with PLA. And worth to mention: the printer is now protected from our cat ( maybe I have to say that the cat is protected from the printer :-). I looked for materials which are easy to get and have the best price for a requested property. I found that the best material for walls is a panel from a cell polycarbonate. This material has the best price per square meter compared to acrylic glass, composite materials or plywood. 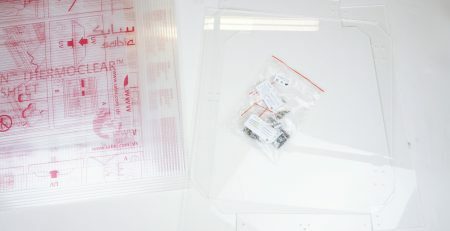 It is light, stiff, transparent and easy to cut and drill. 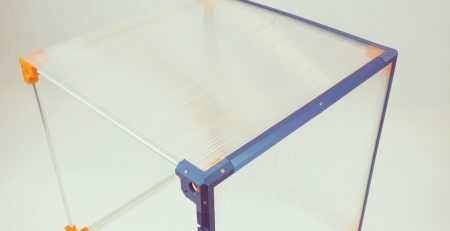 A small disadvantage is the cell structure which makes the panel still transparent but not clear. It is not possible to cut it with the millimeter precision. Cuts along the cell make the perimeter unstable. Therefore edges are to be inserted into edge covers. I played with aluminum tubes and 3d printed joints before. I found aluminum tubes as a cheap replacement for industrial extrusions. 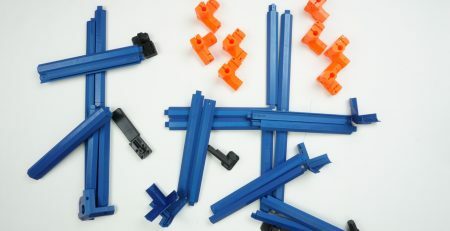 The aluminum tubes are available by common hobby market. The front door is a compromise between price, properties, and design. 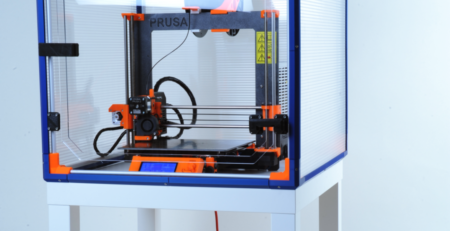 This is the only part to be manufactured – laser cut from acrylic or milled by a milling machine. All other parts are 3d printed. The whole construction is very lightweight. Basic Y-BOX55 weighs only 4,15 kg. Number 55 indicates the size of a base. It is a square with a side 55 cm long, which is the size of IKEA LACK table. The exact outer dimensions are 55,8 x 55,8 x 55,8 cm. This size is one of the smallest possible spaces where Prusa i3 MK2s fits in. However, without original spool holder. I designed new spool holder which works with standardly sized spool well. If you like the box you can make it by yourself. The 3d printed parts STL files are available for download. Other parts you can purchase by yourself or buy parts or kits in our e-shop. I have prepared more possibilities to choose from. 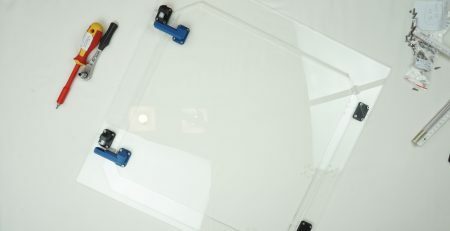 You can buy the laser cut front acrylic door only. All other parts you can buy in a hobby market near you. 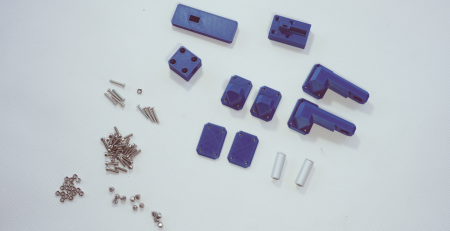 You can also purchase a Maker’s Kit which consists of all parts but 3d printed. If you don´t want to spend time on printing Y-BOX parts, there is also a full kit available which includes also all 3d printed parts.